Death Row. The end of the line. One door in, one door out. Appeals are written. Appeals are rejected. There is usually only one exit from Death Row. Inexorably the clock ticks down to the appointed hour. Usually there is no escape. Josef Jakobs was found guilty of treachery at his court martial on August 5. His penalty was death by shooting. 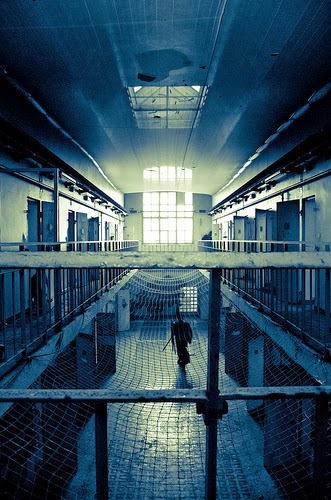 From August 5 to August 15, Jakobs was held in a condemned cell in Wandworth Prison. He knew his execution was coming. The date was set. The venue was chosen. There was no escape.What does that do to a person? In the United States, where the death penalty is still in use, death row inmates who face their imminent execution are sometimes offered sedatives to calm them. Some states ban the use of sedatives but where they are allowed, physicians often prescribe Valium, Ativan or some other anti-anxiety drug. Some prisoners turn down the offer of a sedative. In the 1800s, prisoners facing the gallows were offered a few shots of whiskey to calm them. Several references on Josef mentioned that he had been offered a sedative prior to his execution by firing squad. In October 2009, several objects from the estate of Harold A. Rowe, a former London pharmacist were brought to Eldreds Auctioneers in Roborough, Devon. After reviewing the objects, the auctioneers found several interesting objects: a prescription for a sleeping draught for Rudolf Hess (Deputy Führer to Adolf Hitler), a prescription for Josef Jakobs and a newspaper clipping from August 1941 which reported Jakobs' execution. Prescription for Josef Jakobs - back. One of the newspaper articles which reported the execution of Josef Jakobs noted that, while he had initially refused the offer of a sedative, he relented in the moments before his execution. Rowe was a rather smart man and correctly inferred that the prescription he had dispensed for the English Esq. at the Tower of London on August 14 was meant for the condemned German spy, Josef Jakobs. 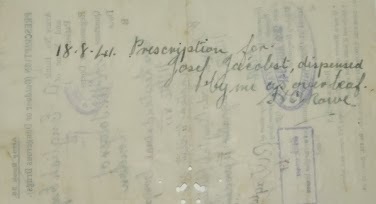 Prescription for Josef Jakobs - front. Josef was prescribed two drugs: Leptandrinae Comp. tablets and Sod. Amytal capsules. Leptandrinae was usually prescribed for dyspepsia and Sodium Amytol was used as a sedative. Leptandrinae Comp. is a homeopathic medicine derived from Leptandra virgincia, also known as Culver's Root or Blackroot. Leptrandra virginica gently stimulates the liver to promote bile secretion without irritating the bowels. It is useful for diarrhea and dysentery. Today Leptrandra compositum is an herbal remedy used to treat minor abdominal pain and discomfort (e.g. gastritis, diarrhea and flatulence). It comes in a liquid form and includes: Leptandra virginica, Quassia amara (Bitter Wood), Podophyllum peltatum (Mandrake), Arsenicum album (diluted arsenic trioxide), Carbo vegetabilis (vegetable charcoal), Niccolum metallicum (metallic nickel) and phosphorus. The prescription for Josef was for twelve tablets of which two or three could be taken at any one time "as required". Sodium Amytal, also known as Amobarbital sodium, is a barbiturate. It has sedative and hypnotic properties. When given orally, it takes effect after 20-60 minutes. When given intravenously, it can take effect after 5 to 15 minutes. Although Sodium amytal has been referred to as "truth serum", there is virtually no evidence that it enhances "memories". It simply lowers the threshhold for sharing virtually all information, both true and false. Sodium amytal can actually increase the risk of false memories. Sodium Amytal came in several strengths, none of which are indicated on the prescription. The prescription is for six tablets of which two could be taken per day. For whom was the sedative prescribed? For Josef? For the guards? For the firing squad? Josef initially did not want to take the sedative, but in the end, relented. Perhaps it had taken effect by the time he was seated in the chair, perhaps not. Perhaps it was more of a psychological comfort for the soldiers who gathered around him to do their various duties. It would be an unpleasant thing to have a botched execution. The executed would soon be out of their misery... not so for those who witnessed the execution... and lived with the memory. Josef may have raged against the "dying of the light" at some point, but on the morning of 15 August, 1941, he was prepared and he went gentle towards that good night. Josef's last words were to the firing squad, "shoot straight Tommies". Even Colonel R. Stephens, hardened interrogator at Camp 020, commented that Josef was a brave man to the very end. Personal communication from a registered pharmacist. Hitler's Nazi deputy Rudolph Hess memorabilia on sale - The Telegraph - October 14, 2009. 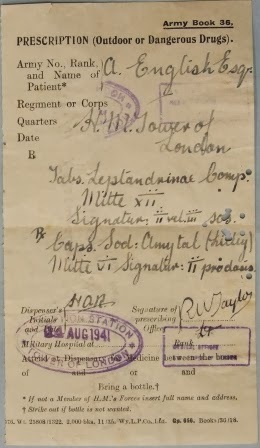 Prescriptions for Rudolf Hess and Josef Jakobs auctioned in Plymouth - This is Cornwall - October 15, 2009. Prescription for top Nazi Hess auctioned in Britain - Catherine Bosley - Reuters - October 20, 2009. Prescriptions for Rudolph Hess and Nazi spy executed at the Tower acquired by Royal Armouries - Culture 24 - October 22, 2009.